I’m sure all of us want to take a swim in a pool. That is why some even have their own swimming pools in their homes. This way, they could dip into the cool water whenever they want to. But of course, it would feel different when you are out of the house and you could spend time in a luxurious place with a pool. There are actually so many lovely places to visit if you are looking for a spectacular pool. Going into one will give you an experience that you will never forget for a lifetime especially if you get into one of the pools that we will feature today. We searched around the web and was totally amazed of the swimming pools we came across. 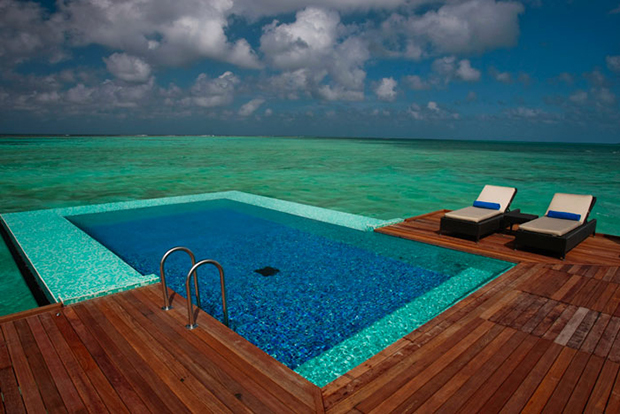 Whether you want a strange pool or a pool with the tropics, you can have it all. You can also get a pool in cold areas or even those extending to the ocean. 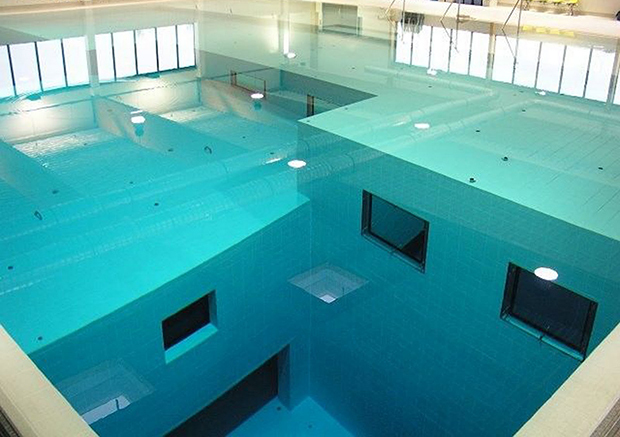 Name it and you will get it in this list of spectacular and strange swimming pools around the world! 1. 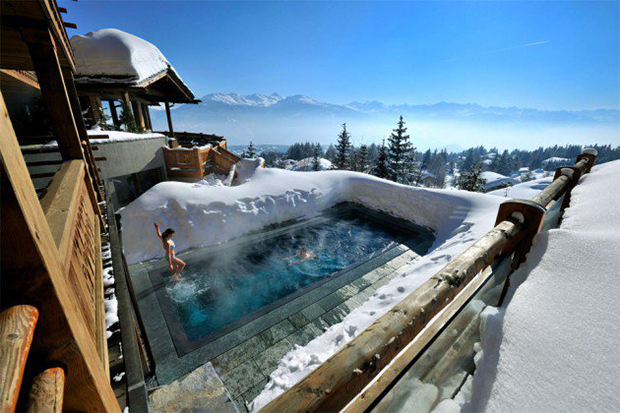 How would it feel to be able to bath in a hot pool while in the Alps? Well this one from Lecrans Hotel & Spa will surely be comforting but it would feel different to wear swimwear in the cold! 2. 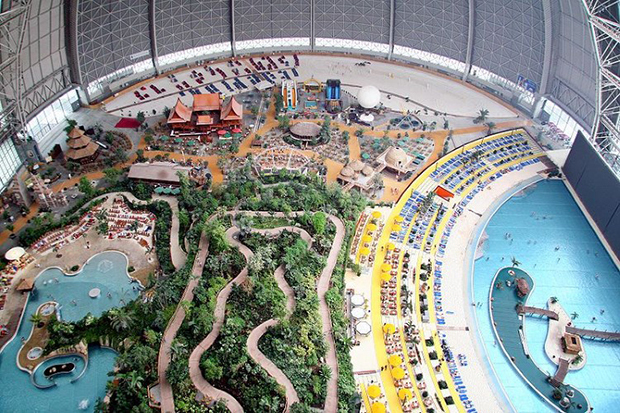 The Tropical Islands Resort of Krausnick, Germany is complete with a rainforest, beach, artificial sun, palm trees and several pools. I think I won’t go out once I get inside! 3. 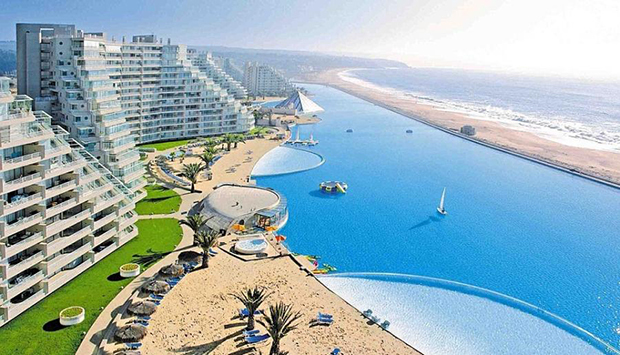 The world’s largest crystalline pool is the San Alfonso Del Mar Resort in Chile that is eight hectares and has 250 million liters of water. 4. 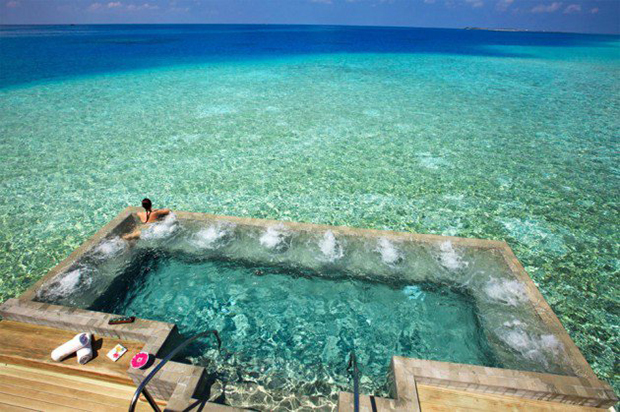 If you want to just watch the sea without actually getting into the salt water, you can dip in the swimming pool instead in the Velassaru Hotel in Maldives. Now that is a unique way to be with nature! 5. 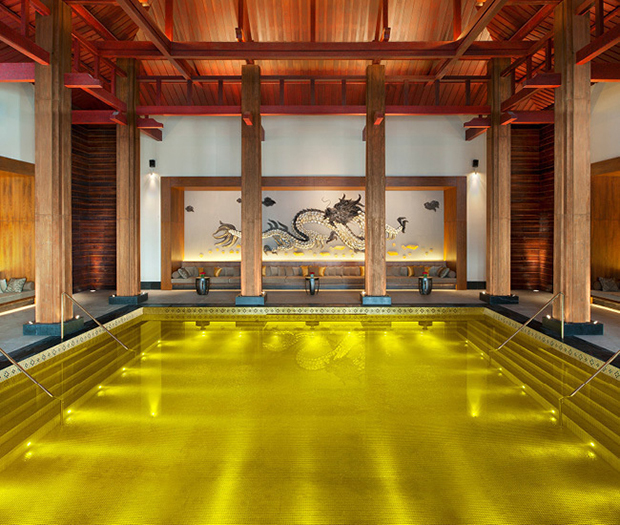 Once you dip in this Golden Energy Pool, you will feel like you have bathed in a gold because this is actually a 24-Carat Gold-Plated Pool in Tibet. 6. 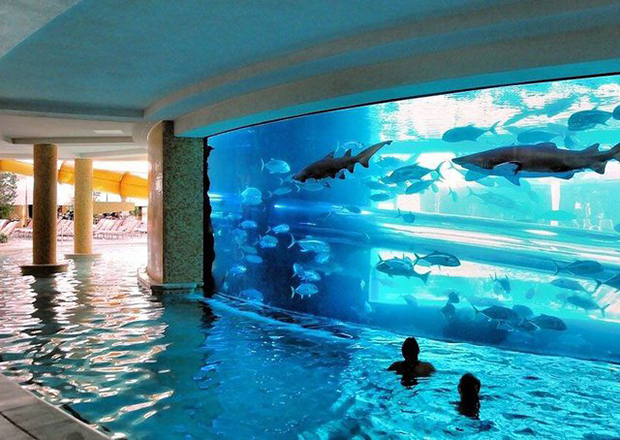 You will feel like swimming with the sharks in the Golden Nugget pool. But don’t worry the sharks will just be merely looking at you! 7. The Hanging Gardens Ubud Hotel in Bali, Indonesia has this stunning infinity pool in free form that overlooks to a rain forest. 8. 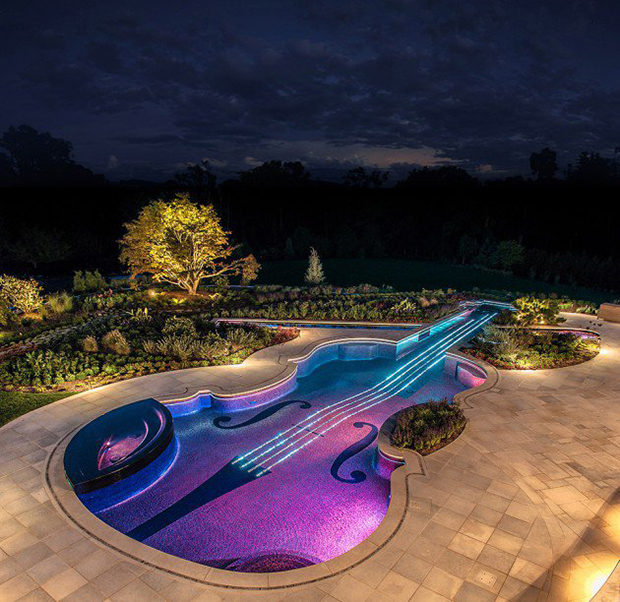 A musician would definitely fall in love with this Violin Shaped Swimming Pool that has amazing lighting. 9. When you are in the Conrad Maldives Resort and Spa, you will feel like floating on the sea while in their infinity pool. 10. 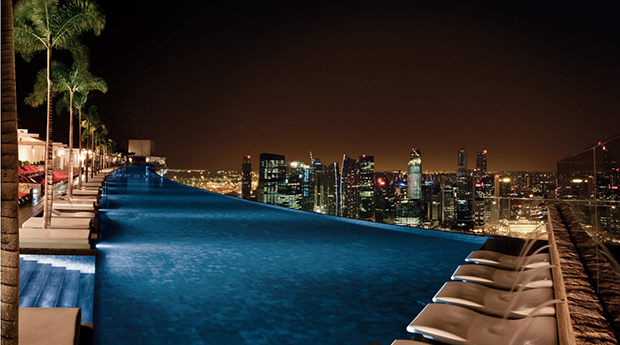 On the 57th floor of the Marina Bay Sand hotel is an infinity pool that will let you see Singapore from the top. 11. 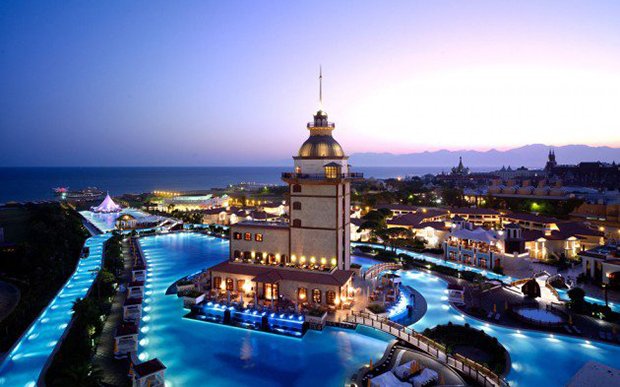 Now this sure is a large pool and it seems you can go around the Mardan Palace Hotel in Turkey through the pool. 12. What a beautiful pool! 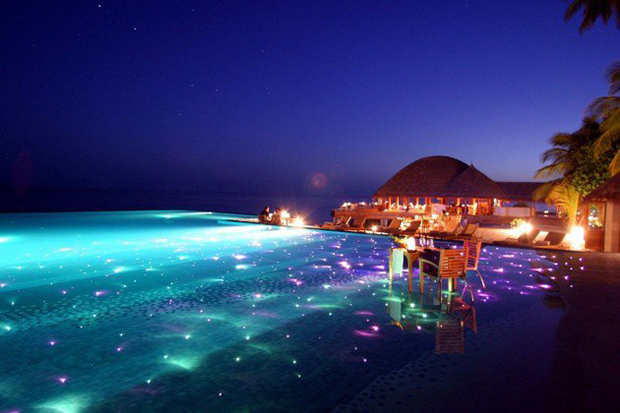 The Huvafen Fushi Hotel located in Maldives will seem to bring you to a magical world with fiber optic lighting. 13. 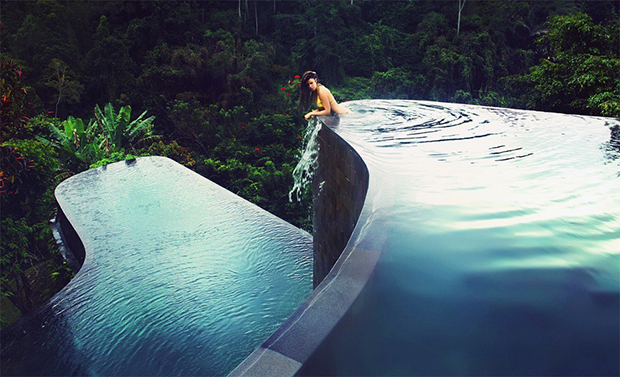 A cliff-top infinity pool in Alila Uluwatua of Bali, Indonesia that has a cantilevered cage-like cabana near it. 14. 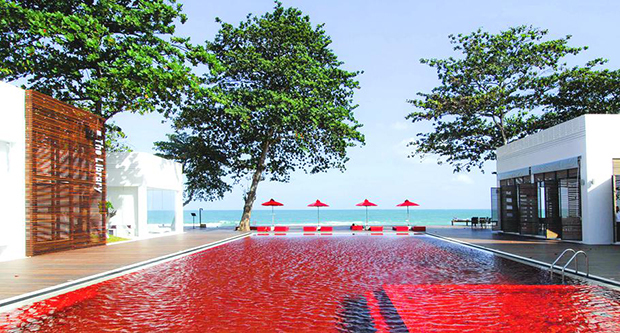 Don’t worry, you are not bathing with blood in this pool of the The Library in Koh Samui, Thailand. It is just the pool flooring and tile color. But it sure looks a bit creepy. 16. 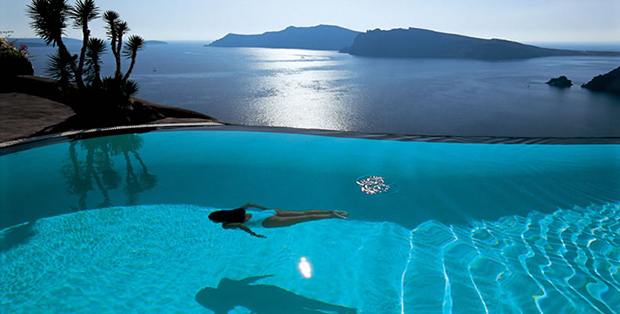 The Perivolas Hotel is located in Santorini, Greece is another stunning infinity pool on a cliff. While you are in the water, it would be hard for you to spot where the pool ends! 17. 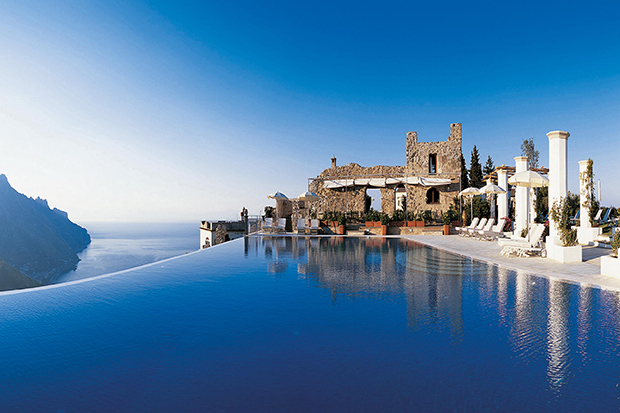 This infinity pool is at the highest point of Ravello. It is from the Hotel Caruso of Italy that gives you a view of the mountains and the sea. 18. 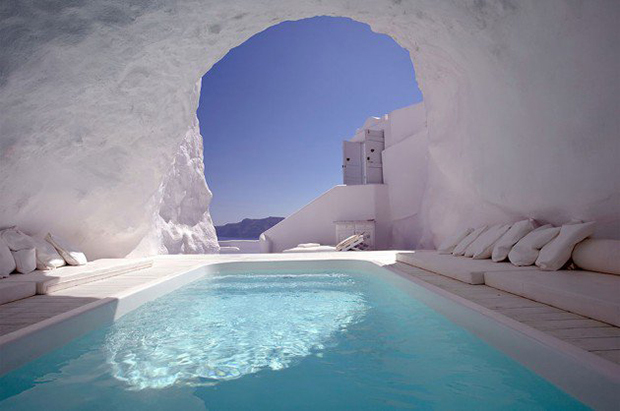 You will be surprised of this Cave pool in Santorini, Greece since it is located underneath a mountain! 19. Nemo 33 is the world’s deepest indoor pool making it the favorite pool for divers as it has underwater cave systems. 20. 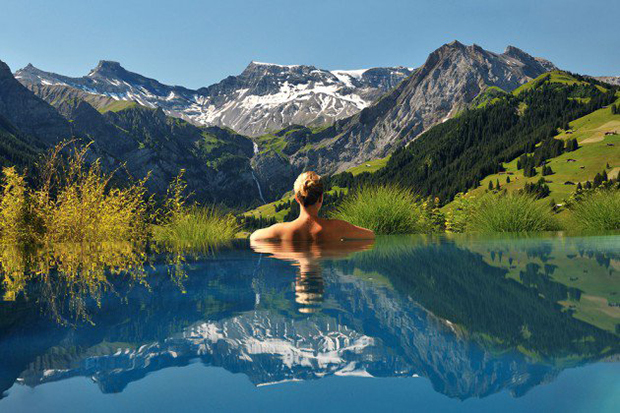 Get a good view of the Swiss Alps while you are in The Cambrian Hotel in Switzerland. 21. Enjoy watching the elephants and zebras in the Four Seasons Safari Lodge Pool in Tanzania. 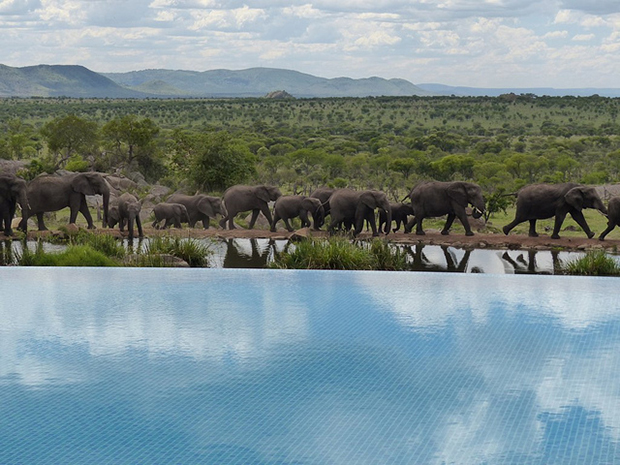 It is a free-form infinity pool that overlooks a watering hole and the Serengeti plains. 22. 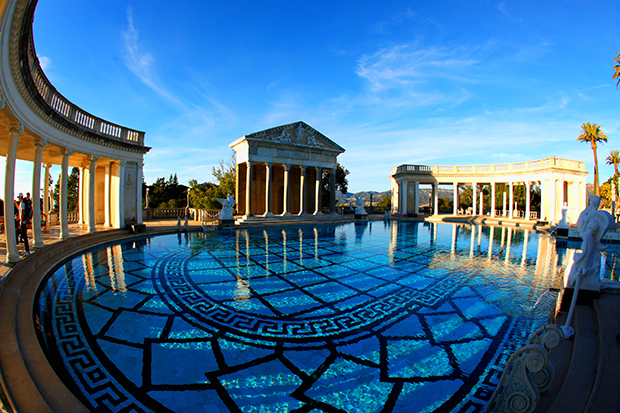 Don’t be tempted to jump in the Neptunes Pool of Hearst Castle in San Simeone, California because swimming is not allowed here. It is merely a highlight of tours in the area because of its rich history. 23. 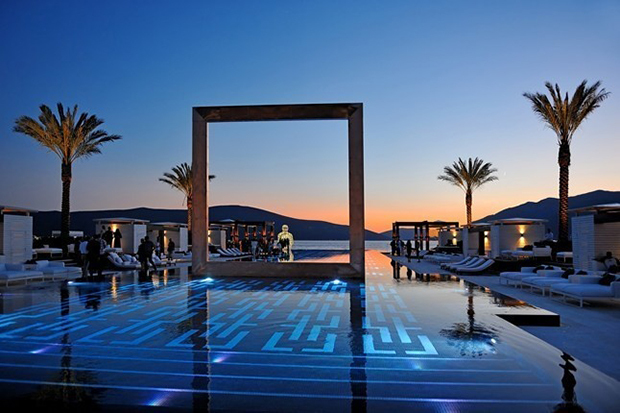 This pool sits in the dramatic bay of Kotor in Purobeach Porto Montenegro. Just look at the design of the flooring and the lighting that adds more drama into it. 24. What a romantic pool! 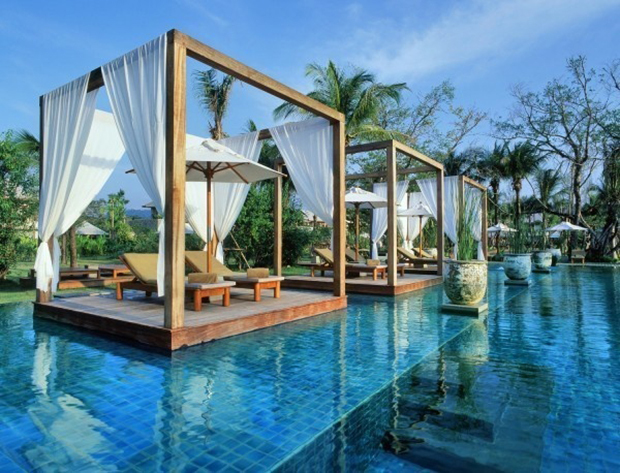 The Sarojin Resort Pool in Khao Lak, Phang Nga, Thailand is indeed something every honeymooners should consider! 25. OMG! 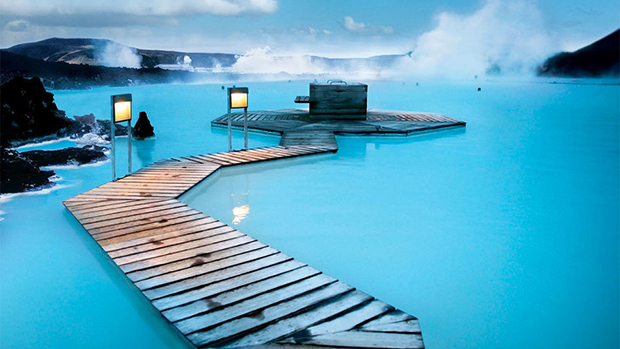 Just look at this pool of the Blue Lagoon Geothermal Resort in Grindavík, Iceland. I’m not sure if I’ll be scared or excited to deep into the water! 26. 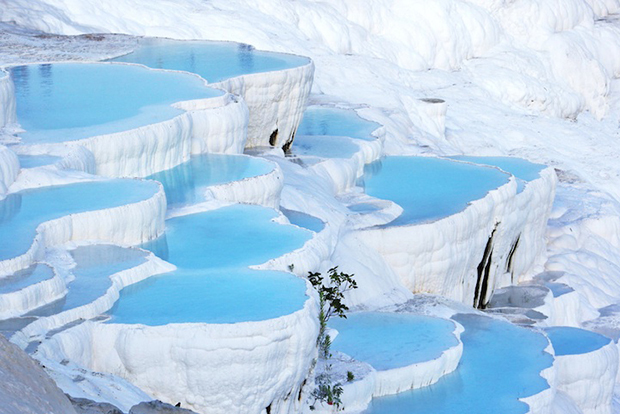 Amazing pools that are inside terraces with bright white calcium and limestone deposits! This is the Pamukkale Pools in Turkey that is said to help heal some illness because of the minerals in it. 27. 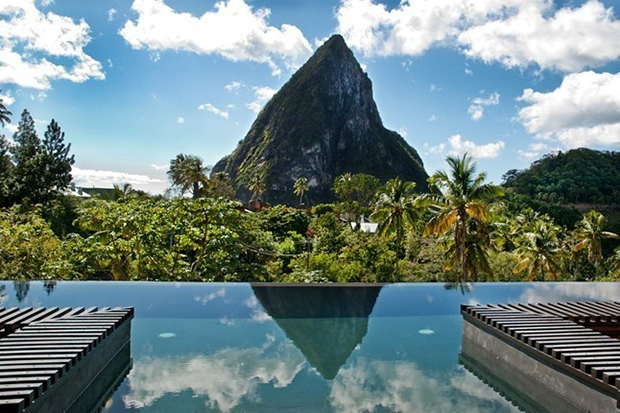 Get a good view of nature in the pool at Boucan by theHotel Chocolat in St. Lucia. This sure is paradise! 28. 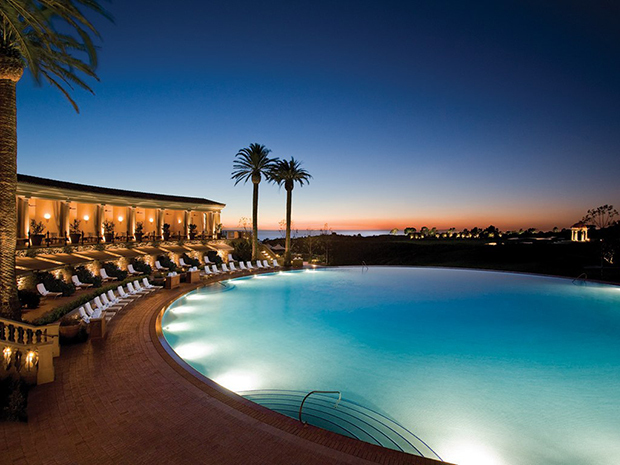 The world’s largest circular pool is seen at the Pelican Hill of California, United States. It has 1 million hand-set glass mosaic tiles in the flooring. 29. 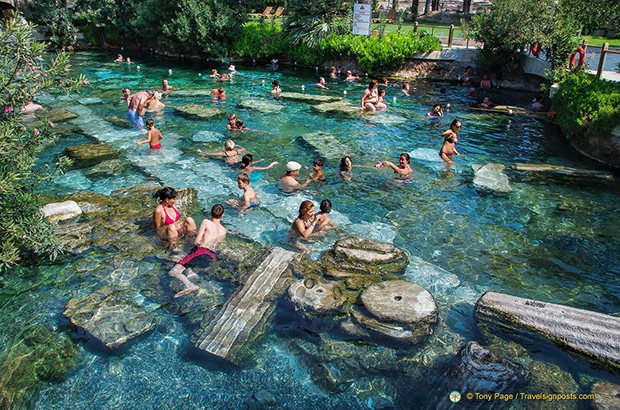 Another pool in Turkey that is interesting is the Sacred Pool with pieces of ruins and columns at the bottom from the long-gone Roman city Hierapolis. 30. 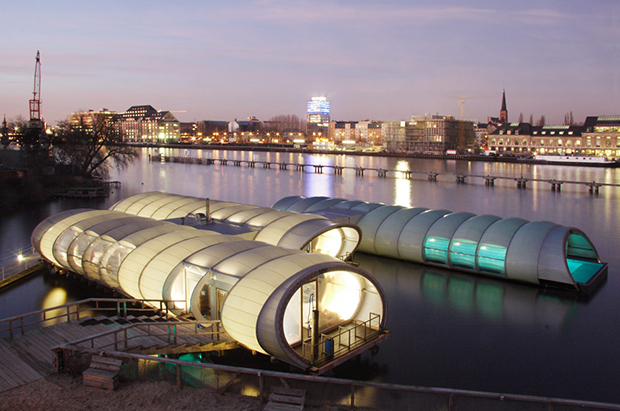 Because the Spree River is much polluted to bath in, the Badeschiff which in German means bathing ship was added to the area. The pool stays open until midnight and when the sun goes down, it is covered as seen in the image to keep the swimmers warm. 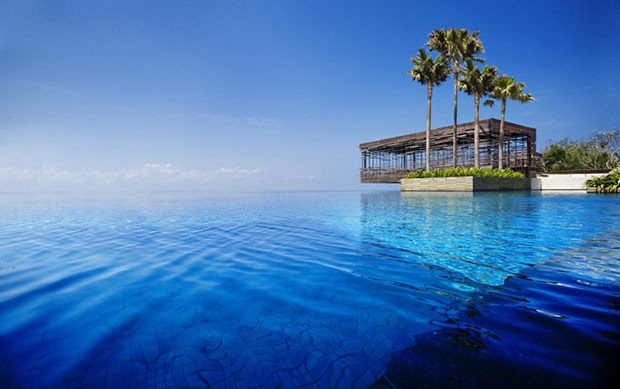 Which of the swimming pools above would you love to visit? Well, it would be nice to get into all of these but it would cost a lot too. I’m pretty sure you could find the perfect pool for you and your family from the above list. They all look inviting but don’t forget that pool number 22 is not for swimming because it is so special! Now, if you are currently in a search for a pool to visit this summer, go back to this list and share this with the people you want to spend time with in these gorgeous waters!